We have a small 25x25 foot garden space that is very productive. What we freeze or can keeps us in fresh, healthy meals for a year. We grow carrots, beets, radishes and mixed lettuce, green and yellow beans, green pepper, over 60 broccoli plants, and some assorted herbs. Our tomatoes are grown separately in another part of our yard, to keep them away from the thornless blackberries growing along the back fence. For example, just 2 thick rows of beans gives us over 60 meals to enjoy. 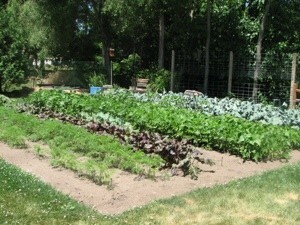 This is one way to grow a plentiful amount of healthy veggies in a relatively small space. Enough to enjoy for a whole year, with extra to share with neighbors and seniors. That is a neat looking garden. Shows you have done some work in it too. Good job.